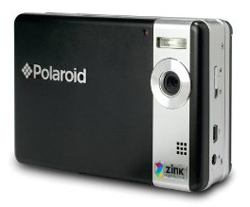 PC Magazine has tested the Polaroid CZA-05300B PoGo Instant digital camera. This Polaroid camera is able to make instant prints in about 60 seconds. Sounds like a pretty cool idea so let us see what the reviewer thinks about the camera. PC Magazine ends up giving the Polaroid camera a pretty good rating with 4 out 5 points. The reviewer likes the coolness of the camera and the ability that you are able to print right away. There are of course some shortcomings like that the camera only can hold 4 pictures at maximum resolution and the battery life could be longer. Overall the Polaroid PoGo looks like a cool gadget. Read the full review of the Polaroid CZA-05300B PoGo Instant digital camera here.